Help is at hand for Local Authorities forced to cancel football matches following the late summer drought, and now faced with unplayable surfaces as rain turns them into mud. 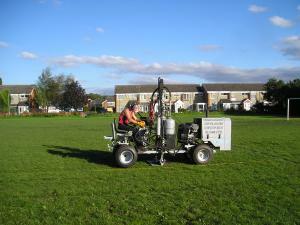 Lynda Green, operations director of Terrain Aeration, who can remember similar conditions following the summer of 2006 says that provided groundstaff have managed to open up the top 4" of the surface, the company's Airforce Terralift machines will be able to de-compact the entire area to a depth of one metre, re-juvinating the soil structure and dispelling surface water. "The Airforce Terralift machine is ideal in these circumstances as its JCB breaker gun (used to break up road surfaces) hammers the hollow probe one metre into the soil however hard and compacted it has become. With alternative equipment, in these conditions the spikes have a tendency to bounce and so not reach the required depth." she explains. Once the Terralift's probe has penetrated one metre into the subsoil a controlled blast of compressed air is injected fracturing and fissuring the soil as it makes its way to the surface. Importantly, on the tail end of this air blast dried, milled seaweed is released which sticks to the walls of the fractures, swelling and contracting, creating movement within the soil and keeping the air fractures open. "The groundsman's surface aeration should link into our treatment," Lynda continues "and once the system is up and running the re-juvinated soil structure will sustain the grass roots during drought and provide natural drainage during wet weather."